Recently, I sat down and jotted down a list of things I wanted to try to make. One of those was empanadas. I love Cuban food (I discovery I made while in Miami a couple of years ago) and a friend recently recommended a Cuban restaurant here in New Jersey that we went to and had a great meal at. One of things we enjoyed was their beef empanada. I decided to come home and try making a baked version myself. If you have a child - or ever been a child yourself - you know that kids are quite picky. So for my empanada filling, I had to keep it simple with familiar flavors. So I grated the onion that went into my picadillo filling and skipped some of the other common ingredients such as olives and peppers that often go into this savory meat filling. I added some diced potatoes and made empanadas with and without cheese. Did you know you can buy empanada/pastry discs from Goya in the freezer section of your grocery store? That's what I used and I was glad for that shortcut. The empanadas were a hit at my house - the fellas preferred the ones with cheese a bit more than the ones without but they were both good and I loved the fragrant, meaty filling in each. Incidentally, the picadillo filling would be great in stuffed peppers, or just eaten on its own over rice. As for the empanadas, they also freeze very well, as I discovered from this happy project. Besides empanadas, there was enchiladas. I'm not very well versed on Mexican food beyond tacos and fajitas and I wanted to branch out a little. I managed a simple chicken and cheese-filled enchilada for dinner one night but while the adults enjoyed it, I have to tell you it was not a hit with the little man in this house, as the enchilada sauce was too smokey for him. Luckily, I'd made arroz blanco, which is a favorite here with us, and the little one was happy with rice and the cheesy chicken filling. Inspired by my son's love of Vietnamese fried spring rolls, I recently tried a baked version in my kitchen, thanks to a lot of help from Wishes and Dishes' recipe. Filled with ground pork, shredded carrots, and scallions, I flavored the filling with grated garlic, ginger, oyster sauce, soy sauce, and a dash of fish sauce. You can find square spring roll wrappers in the freezer section of an Asian grocery store. They bake up shatteringly crisp! 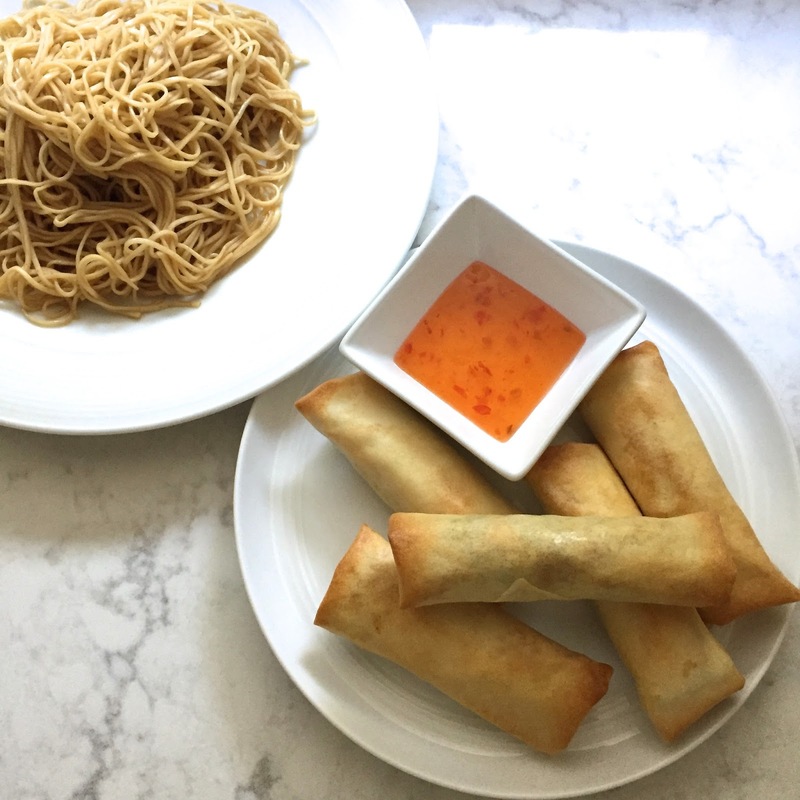 I served these spring rolls with thai sweet chili sauce (though they're so flavorful, you don't even need a dipping sauce) for lunch, with a side of noodles. They may have been more Chinese, rather than Vietnamese-style, spring rolls but they were very tasty. And the good news is I still have a few tucked away in my freezer for another day! ...and when we tried to do it again another time but scallops were not available that morning at the farmer's market, I put a very simple version of shrimp and grits together. Admittedly, the little guy is having pizza or a meatball sub when we're having more "exotic" fare like this for lunch or dinner. And also on the Southern front, I checked chicken and dumplings off my list recently! I had a bowl in Charleston and realized I'd never eaten it before, and it was as comforting as we expected it to be. I got very lucky when I saw Tricia's homemade recipe at Saving Room for Dessert. I abandoned all the other recipe and ideas I had and went with her instructions. It was totally worth the effort of making your own simple chicken stock from scratch, which I did a day ahead so I could skim the fat off the surface the next day when I finished the soup. The dumplings were easy to assemble and I liked how the flour on the dumplings thickened the soup enough without needing to add cream or creamy soup mixes into the picture as you sometimes see in other recipes. 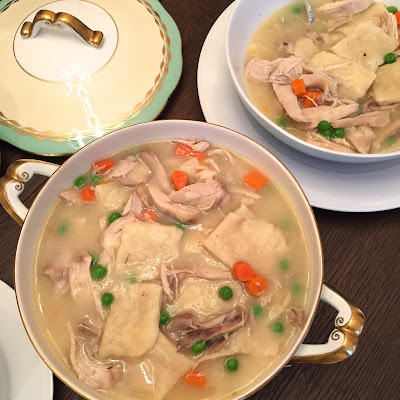 The chicken and dumplings was comforting and hearty - a meal in a bowl that my family and I were thankful for on a brisk night. And incidentally, we enjoyed leftovers the next day for lunch with a few empanadas baked straight from the freezer. More on the "by-request" front, one thing the little guy requests a lot is buffalo wings. I bake them and then toss them in buffalo sauce. I recently made a big batch with another favorite of the fellas - twice baked potatoes. Another popular dinner item for my fellas is pork chops! I saw a recipe on Southern Souffle for smoky bacon pork chops and decided to make them. 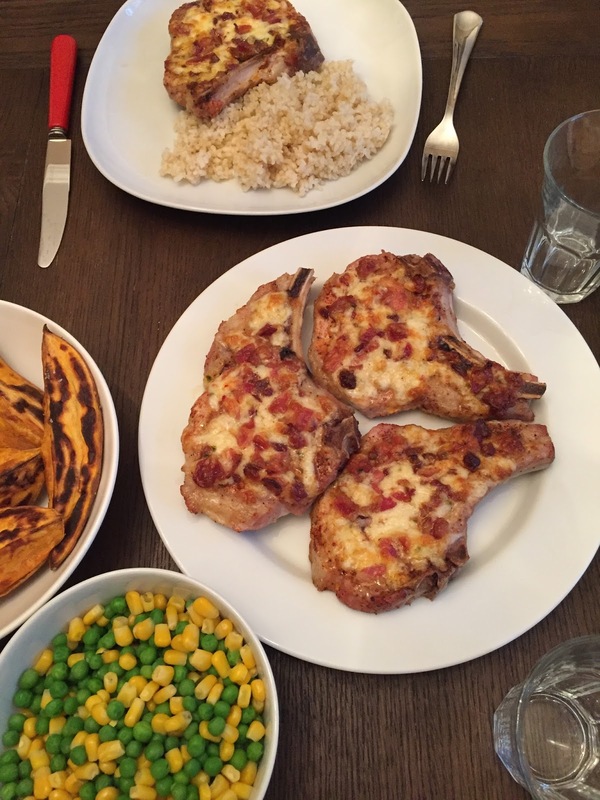 Not surprisingly, the pork on pork (not to mention cheese-smothered) chops were a big hit. So that's a little look at some of what's been cooking around here lately! Which makes me ask...do you ever think about how much food you and your family consume, and feel amazed by it? To say it takes a whole lot of fuel to power our minds and bodies is an understatement! And it's because we do eat so much, and because I do need and want to cook so much, that I have to try new things and keep it interesting in the kitchen! I'm so happy to be able to cook for myself and my family - it's healthier, and so much more affordable to cook at home. I'm truly grateful I enjoy it so much and there are so many resources to learn from! Ultimately, it's simply so satisfying to provide a good meal to share with loved ones. And you know what rounds a meal out really nicely...? Dessert! I'm still baking, taking advantage of all the lovely recipes I've discovered in the last few years of blogging about my baking endeavors. To be honest, I feel like I've got a solid repertoire in my archives and I don't have a long list of new recipes I want to try right now on the baking front. That said, I'm always open to and eagerly anticipate whatever new inspiration comes my way! I know it's early yet but I'm already looking forward to holiday baking, particularly since we missed much of that last year when our kitchen was being updated! I did try to make something new this past weekend...I wanted to bake something with sour cream again (in my head after making theose amazing Chocolate Heaven cupcakes recently). At first, I planned to bake a crumb cake but instead decided to try a sour cream vanilla pound cake, which I then decided to add chocolate chips to. Unfortunately, the chocolate chips mostly sank to the bottom. That didn't stop us from enjoying it but maybe it was a sign that I need to wait for proper inspiration when it comes to baking something new. It's always nice to end with cake so I'll stop here. Thanks for stopping by! Happy cooking and eating to all! Lots of mouthwatering and healthy foods, Monica. I love esp. that chicken dumpling dish. It was great to learn how to make chicken & dumpling from scratch and it wasn't really all that rigorous. Very tasty and great share from Tricia! Oh my goodness - you could be a professional home chef baking and cooking for the rich and famous. It all looks and sounds fantastic. I love that your guys help out with suggestions, that is part of the battle - trying to decide what everyone wants. So happy you made the chicken and dumplings. We love it and will be making it again before the winter is gone. Thanks for the link love and all the beautiful inspiration! You are way too kind, Tricia! I don't know what would give you that impression at all but I thank you. And thanks again for the chicken & dumplings recipe. Nice to do it all from scratch and get that homemade flavor. So nice and a great all in one bowl meal for the whole family. Thanks again for your kind words, as always. Loving all the dinners that you made in past few weeks. And,I agree with Tricia totally on how you could be a professional home chef. Seriously - if I were a cook for someone, I'm sure I'd be fired in a week or so! It's so easy at home when it's no biggie if something doesn't turn out that well. Thank you, Bal! We also ate at Magnolia's when we visited Charleston a year or so ago for a wedding and loved it! Too funny since I had completely forgotten about it until I read this! It looks like you are definitely cooking up some delicious dinners as of late! I've been getting back into cozy food lately now that the weather has finally cooled down some! Oh, we had such a nice time in Charleston - the food really is amazing and Magnolia's was highly recommended. I think I will be thinking about those stuffed peppers for a long time to come...one of the best things I ever ate! Happy fall and cozy cooking to you! Wow! you've been cooking up a storm Monica, love every single one of these dishes especially the empanadas, they would be a huge hit around here. What a delicious cooking marathon! Love them all! So many different things to try here. 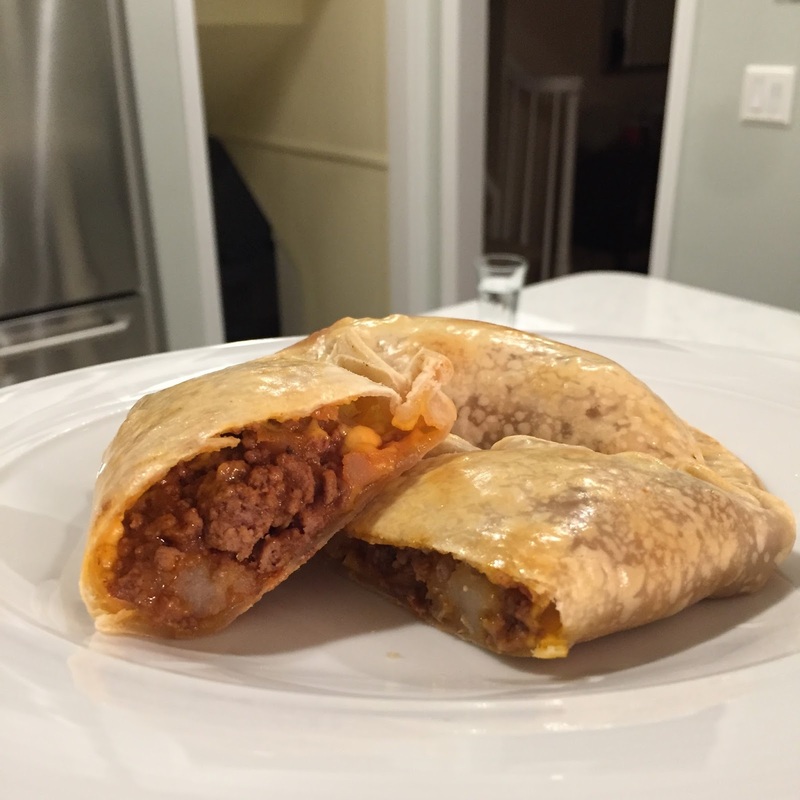 Love the sound of those empenadas and enchiladas! I must say that you certainly have had some delicious sounding meals...I would be hard pressed to decide which one I would try first. Thank you. Fun to try new recipes, for sure! Thank you, Kelly. I made curry beef puffs last night, too. ; ) Been experimenting on the savory end to keep things interesting for myself in the kitchen. Hope all is well with you. Enjoy fall!